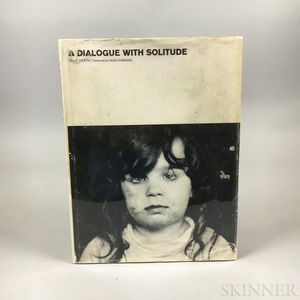 Heath, Dave (1931-2016) A Dialogue with Solitude. New York: Community Press, Distributed by Horizon Press, 1965. Large quarto, bound in publisher's gray cloth and in a price-clipped dust jacket (tears to jacket repaired with tape on the verso), foreword by Hugh Edwards, illustrated throughout with Heath's photographs, some foxing to text, 11 x 8 1/4 in.